Today I’m going to help you prepare for the next three months of Standard finance. There are precisely two events that can shake up Standard before rotation, and both are happening next week. First, the Banned and Restricted Announcement is this Monday, July 2nd. Second, Core 2019 will be released on July 6th on Magic Online in the form of Sealed Leagues, and on July 9th will be fully released. What I want to examine today is whether these two events will change the financial outlook of cards already in Standard. Will any cards go up in value? Are there certain cards you should sell? How might Standard look over the next few months? Read below to find out! I. Is the Ban Hammer Coming for Goblin Chainwhirler? Goblin Chainwhirler has a ridiculously low price on Magic Online right now: 0.68 tix. As a rare in a set currently being drafted, an accurate valuation based on the amount of play it sees would be somewhere between 1.50 and 2.50 tix. 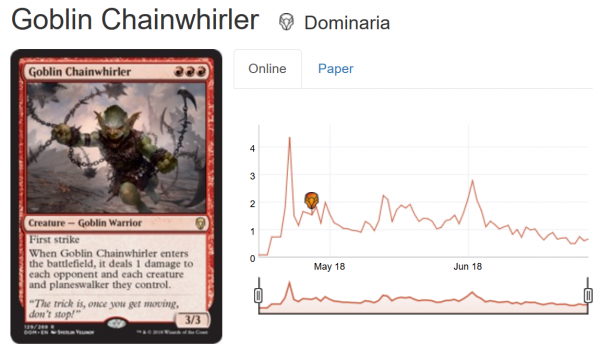 Clearly, then, the market feels moderately confident that Chainwhirler will be banned. The week before Energy was banned, I predicted the ban correctly. I’m far less confident that Chainwhirler will be banned than I was about Energy. This go-around we don’t have the indications from Wizards R&D personalities about how Chainwhirler was bad design or a design mistake, the overall mood of the MTG Community is relatively better now because of the overall success of Dominaria, Standard participation has rebounded, and we are approaching a rotation that will see red weakened significantly. My gut tells me that Chainwhirler will not be banned, and if it is banned, Rampaging Ferocidon will be unbanned. I think there’s an outside chance that they get cute with the B&R announcement, either unbanning a lot of the cards currently on the Standard banlist or banning Chainwhirler specifically until rotation. But, at the end of the day, I think the likely aftermath of the B&R announcement will be that red will still have a premier three-drop that guarantees it a prime position in Core 2019 Standard. II. What Improves If Chainwhirler Is Banned? The decks most likely to benefit from a Chainwhirler ban are Stompy, White Aggro, and Tokens. Stompy because Llanowar Elves gets better. White Aggro and Tokens because not all of their threats and board advantage engines will meet such easy deaths and be so easily countered. I don’t think the overall price valuation of green cards will change very much. Jadelight Ranger is currently at its all-time low, and I think that that is a good speculation heading into rotation (I’ve got 35 copies of it right now). But that’s not a speculation you should look to cash in on over the next few months. White cards, however, could see some genuine price resurgences. The biggest short-term beneficiaries of a Chainwhirler ban will be cards contained in Anointed Procession decks like this. 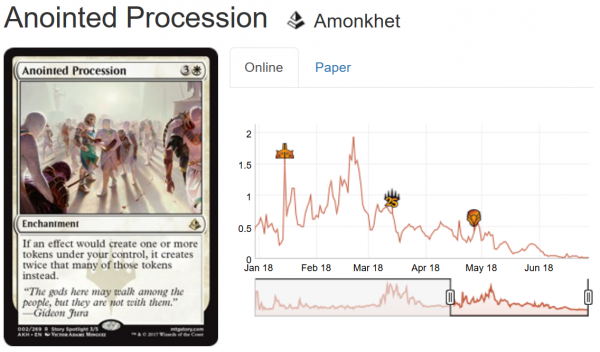 Anointed Procession, currently at bulk rare pricing, could spike up to 0.50 tix or even 1.00 tix. Adorned Pouncer, also at bulk, could spike up to 0.25 tix. Angel of Sanctions, too, could get in on the price spike action, although that one bears more risk. Long-term, a Chainwhirler ban will improve the odds that these four cards see Standard success, and all but guarantees that Legion’s Landing and Benalish Marshal will be lucrative investments. Legion’s Landing is currently hovering just above 1.00 tix, and that won’t last long if Chainwhirler gets banned. III. Will Core 2019 Alter the Standard Landscape? After reading articles by pros at Star City Games and doing some of my own brewing, I can identify a few different ways that Core 2019 could shake the predictable and stale metagame. The most likely contenders are (i) that Zombies rises to tier status off of the back of new lords, and (ii) that Tezzeret gives artifact-improvise decks the raw power it’s been lacking to be truly competitive. Regarding Zombies, I am deeply skeptical because the deck seems incapable of presenting a line of attack different from the one that red aggro presents more potently. It needs to go wider than red, but it doesn’t seem to have the tools to do so. Consider this ultra-streamlined Zombie deck that I built. It’s one token-producer short of presenting a unique line of attack that I think it needs to be a competitive option. If Wizards bans Chainwhirler and leaves Ferocidon banned, then I think this deck could be a real competitive option. In such a scenario, the best specs would be Ifnir Deadlands and Dread Wanderer. Both would be poised to quintuple in value. Regarding the artifact-improvise deck, I remain less confident in predicting one way or the other. And I couldn’t in good conscience recommend a spec into such an abyss. Herald of Anguish would likely see the largest gains, and perhaps at its present 0.72 tix price tag the risk is low. Spire of Industry is criminally low right now too, but that’s more of a long-term spec opportunity. Investing in Karn, Scion of Urza feels like a mistake prior to Heart of Kiran leaving the format. Ultimately, therefore, unless red receives a major nerf, I think the fabric of Standard is going to remain intact. The cards that are good now will continue to be good, and the cards that are bad will continue to be bad, which means that short-term speculation opportunities are going to be hard to come by. Keep that in mind as you look for short-term speculation opportunities, and keep in mind that short-term speculations are at their riskiest at this time of year—not only is there less interest in Standard overall, but an impending rotation means that a failed speculation could prove calamitous, especially a speculation on a Kaladesh or Amonkhet block card. Let me know in the comments below what you are thinking of investing in, and how excited you are about Core 2019. Thanks for reading, and I’ll see you next time!